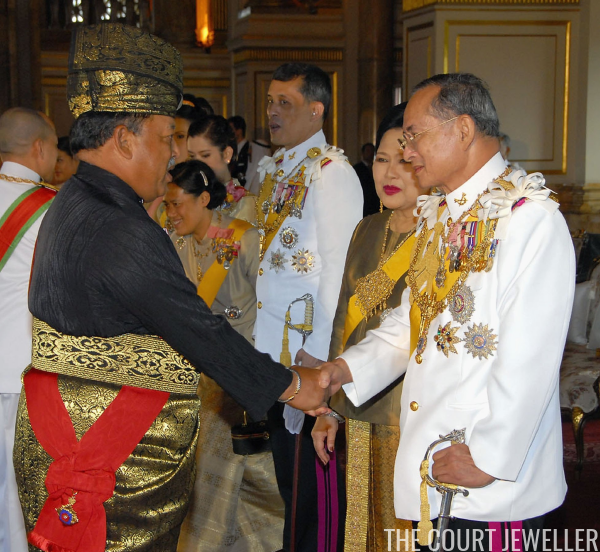 The Sultan of Brunei arrived at the reception wearing the Order of the Rajamitrabhorn, which is bestowed by Thailand's monarch on foreign heads of state. 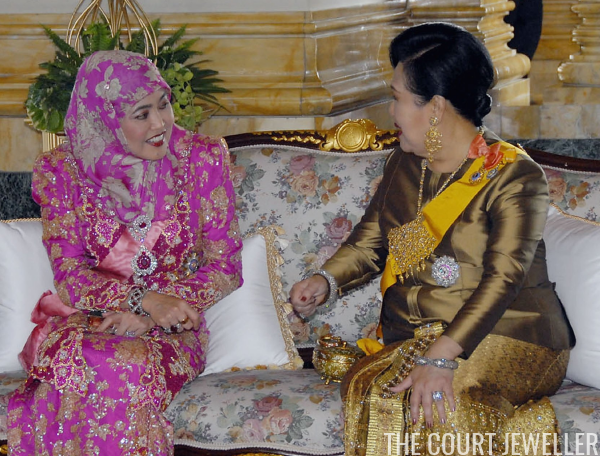 With him is Queen Saleha of Brunei, who wears the light pink sash of her highest Thai order, the Order of Chula Chom Klao. 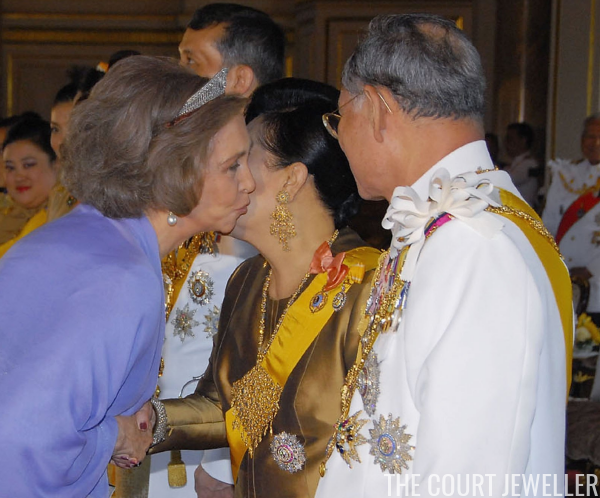 Here's a better look at Queen Saleha's jewelry, as well as the elaborate golden and diamond jewels worn at the reception by Queen Sirikit of Thailand. 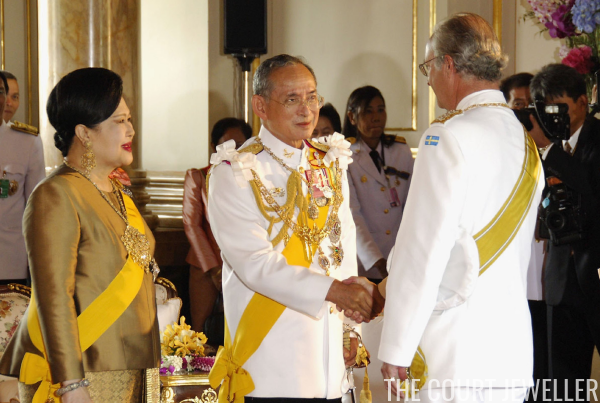 Queen Sirikit is wearing the sash of the Most Illustrious Order of the Royal House of Chakri, which is awarded to members of the Thai royal family, as well as other foreign heads of state and royals. The British royal family was represented at the reception by the Duke of York. 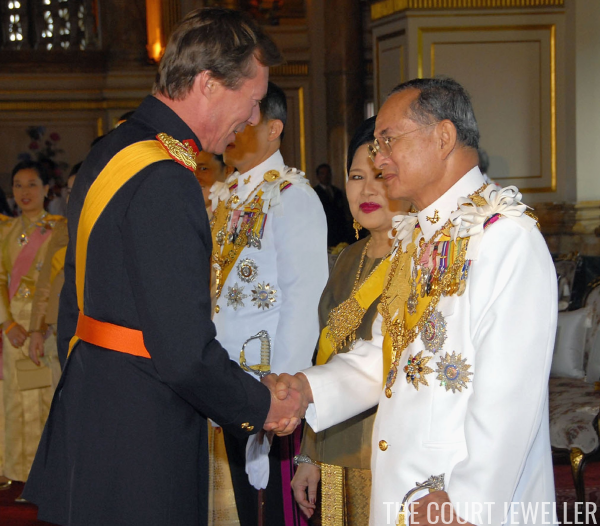 He does not have a Thai order, so he wore the sash of his highest British order of chivalry, the Order of the Garter. This was actually one of the first times he wore the Garter, as he'd only been appointed to the order that April. This reception took place on June 12; he was officially invested as a Knight of the Garter one week later, on June 19. Representing Belgium at the reception were the Duke and Duchess of Brabant (now King Philippe and Queen Mathilde of the Belgians). Mathilde wore her white and yellow diamond earrings, plus a glittering diamond bracelet. Both wore their highest Belgian order, the Order of Leopold. Princess Lalla Salma of Morocco wore one of her gorgeous kaftans with an embellished belt, plus glittering earrings. Emperor Akihito and Empress Michiko of Japan both attended the reception. 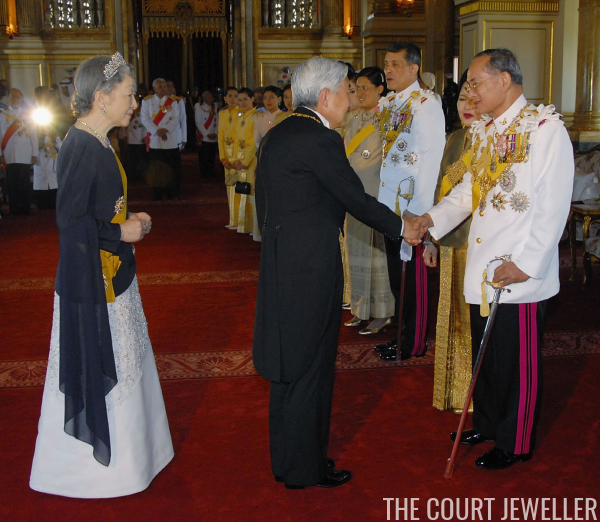 Michiko wore the Japanese Honeysuckle Tiara with diamond jewels, plus the sash of the Most Illustrious Order of the Royal House of Chakri. Malaysia's monarchy is a unique one: its king, the Yang di-Pertuan Agong, is elected. 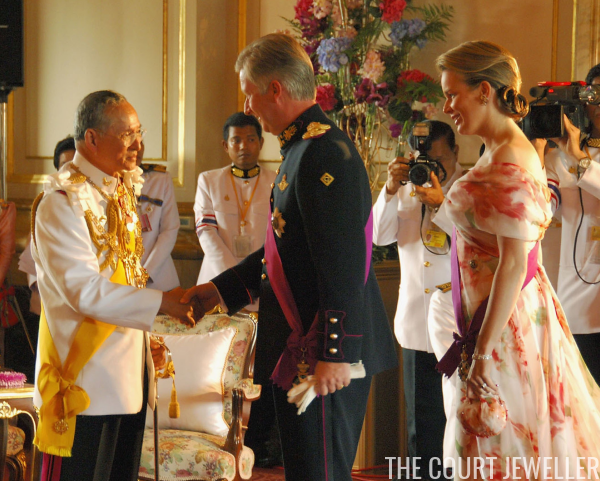 In 2006, the king was Sirajuddin of Perlis. 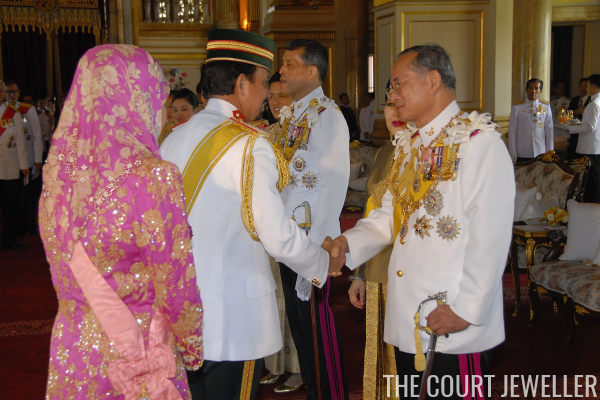 He attended the reception wearing the red sash of the Order of the Royal House of Malaysia. 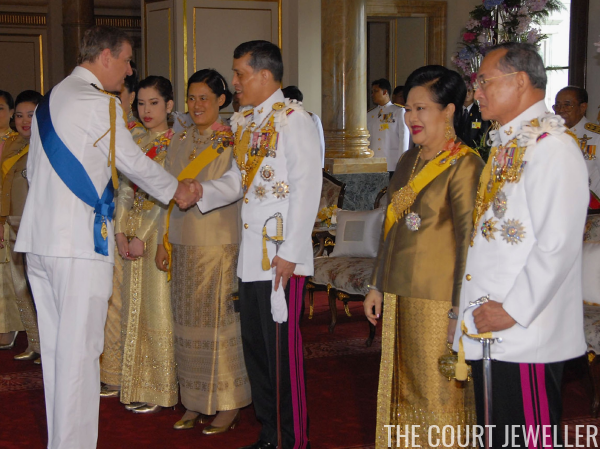 Grand Duke Henri of Luxembourg attended the reception; because he does not have a Thai order, he wore the sash of the Order of the Gold Lion of the House of Nassau. Only a few months after his own inauguration as Monaco's sovereign, Prince Albert II attended the jubilee festivities. 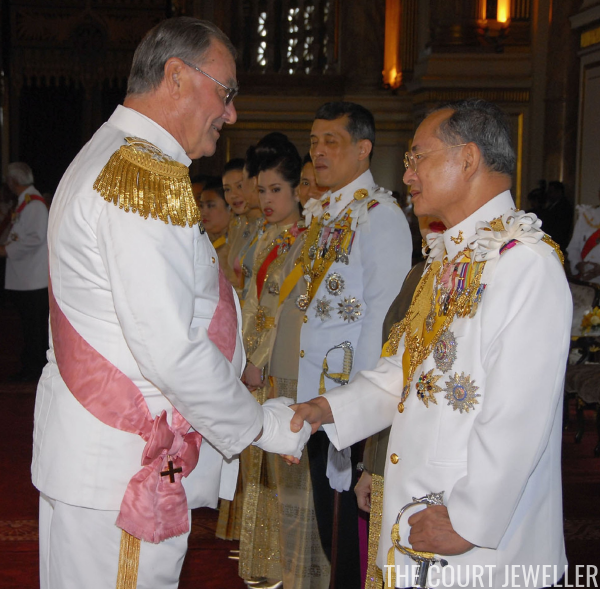 Representing Denmark was Prince Henrik, who wore the sash of the Order of Chula Chom Klao. King Carl XVI Gustaf and Queen Silvia represented Sweden. 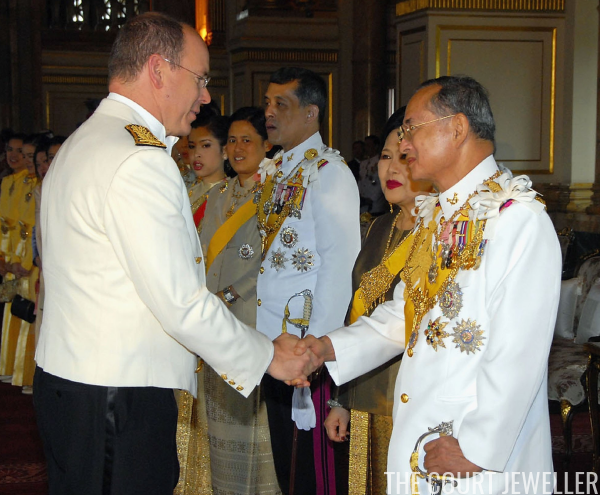 Carl Gustaf wore the Order of the Rajamitrabhorn. 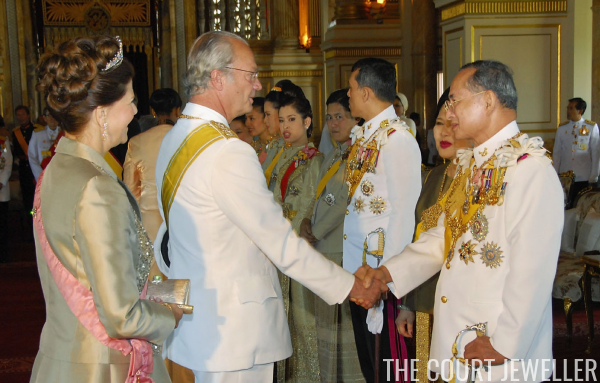 Queen Silvia wore her Modern Fringe Tiara, plus the sash of the Order of Chula Chom Klao. Perhaps the biggest surprise of all came from Queen Sofia of Spain, who wore the Order of the Royal House of Chakri (which she had received that February) with the Prussian Tiara. This is one of the only times -- perhaps the only time? 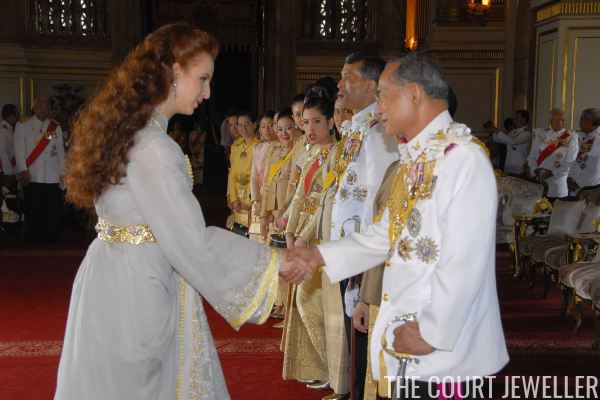 -- we've seen her wear the tiara since she loaned it to Queen Letizia for her wedding in 2004. Stay tuned for more glittering goodness, including a boatload of tiaras, from this Diamond Jubilee tomorrow!